Efiling or electronic filing is submitting your income tax returns online. There are two ways to file your income tax returns. The traditional way is the offline way, where you go the Income Tax Department’s office to physically file your returns. The other way is when you e-file through the internet. Over the past few years, e filing has become popular because it is easier, doesn’t require prints of documents, and can be done for free! Am I Required to File Income Tax Returns? Financial Year is the period between 1st April to 31st March. Assessment Year is the next year in which the income is liable to tax. For example, if your financial year is from 1 April, 2018 to 31 March 2019, then it is known as FY 2018-19. The assessment year for income earned during this period would begin after the financial year ends–that is on 1 April 2019 until 31 March 2020. Want to check how much income tax you’ll pay or see how deductions affect the income tax you owe? Use the income tax calculator to calculate your tax liability for the last 3 financial years. Has E Filing Tax Returns for 2019 Started? E filing income tax returns for the assessment year 2019-20, which is the financial year 2018-19 has started. The Income Tax Department will release the new ITR forms after 31st March and efiling for them will be allowed on their website as well as on ClearTax website. We will incorporate all the changes in the new ITR forms to make it easy for you to e-file your returns. What is the Deadline for E-Filing Tax Returns? The last date for efiling income tax returns for FY 2018-19 is 31st July 2019. You can e-file your tax returns any time before then, but it is always better to e-file early to avoid the rush and heavy website traffic in the last month. Should I E-File Returns if I Earned Less Than Taxable Income? Yes, it is advisable to e-file your income tax returns even if you don’t pay taxes. A zero-return filing will be helpful when you need to get your tax refund or apply for a loan or visa. How Can I Go About E-Filing Multiple Tax Returns? 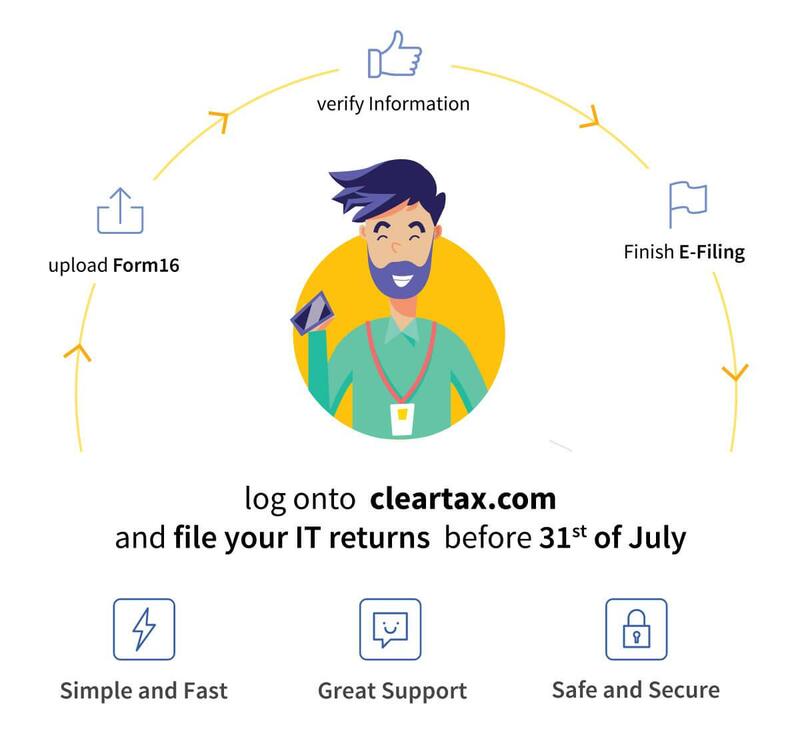 You don’t need to open different accounts on ClearTax to e-file multiple tax returns. You can e-file for returns for the current, as well as the previous year from the same account. What’s more? 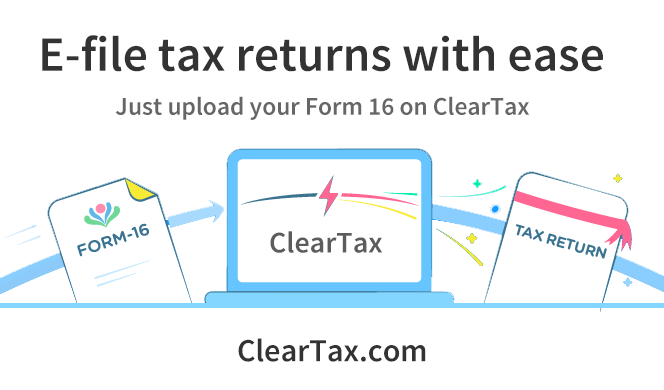 You can even e-file tax returns for your friends and family from your own ClearTax account. Here’s how. I have a Form 16, How do I E-File My Income Tax Return? After successfully submitting your income tax return, you get an acknowledgement from the IT department called the ITR-V or Income Tax Return-Verification. You receive a mail on your registered e-mail ID from the Income Tax Department containing the ITR-V. So you’ve lost access to your Income Tax Department account because you don’t have the password, and you’re afraid you won’t be able to e-File or access it again? Don’t worry because ClearTax can help you out. It is reccomended to link your PAN with Aadhaar and mention it in your IT returns. If you have applied for Aadhaar, you can mention the enrollment number in your returns. Rs. 5000 if return is furnished on or before the 31st day of December of the assessment year i.e. for FY 2018-19, assessment year will be 2019-20 and so the relevant date will be 31st dec, 2019. However, late filing fee shall not exceed Rs. 1000 if the total income of an assessee does not exceed Rs. 5 lakh. Do I need to report exempt LTCG in ITR-1? Yes. In ITR1, under Part D – computation of tax payable, there is a column for exempt income. In this column, you have to report your exempt LTCG.If the LTCG is from sale of equity shares, you can mention it in the column given for “Sec10(38)”.For any other LTCG, mention it under the head “others” given under exempt income. To know more, you can read our article on ITR1. How to report Cash deposits during demonetization period in ITR1? How to report bank accounts in ITR-1? You have to mention the detail of all the savings and current accounts held by you at any time during the financial year for which you are filing the return. So if you are filing the return for FY 2016-17, then mention the detail of all the saving and current accounts held at any time during FY 2016-17.Please indicate the bank account in which you would like to get the refund credited irrespective of whether you have refund or not. The account number should be as per the core banking solution (CBS) of the bank. It may be noted that details of cash deposited are to be provided only if the aggregate amount of cash deposited during 09.11.2016 to 30.12.2016 is Rs 2 lakhs or more. Which ITR form to file in case of presumptive income? ITR 4 is applicable for the taxpayers following presumptive income scheme. A doctor or engineer can opt for presumptive income scheme u/s 44ADA if his gross receipts don’t exceed Rs 50 lakhs and can declare 50% of gross receipts as his income. Persons engaged in the accountancy profession, Interior decoration, Technical consultancy can also for this scheme. Freelancers engaged in the above profession can also opt for this scheme if their gross receipts don’t exceed Rs 50 lakhs. Businessman having turnover less than Rs 2 crore may opt for the scheme u/s 44AD and declare the profits at 8% of gross receipts(6% in case of digital receipts). To know more, click here. Can a company of professionals say lawyers can file ITR 4 for presumptive income. No. only Individuals, proprietors, HUF, partnerships can. Companies, AOP, BOI, limited liability partnerships cannot file ITR 4.For more details click Which ITR to file. Do I need to report exempt dividend income from shares/mutual funds in ITR Form 1? Yes. In ITR1, under Part D – computation of tax payable, there is a column for exempt income. In this column, you have to report your exempt Dividend income. If the dividend is received from Indian company, it should be reported under section 10(34) and if the dividend is received from mutual funds, it can be reported under the head “others” given under exempt income. How to mention Aadhaar enrollment number in ITR forms? ITR forms released for FY 2016-17 (AY 2017-18) have a 28 digit column for quoting Aadhaar enrolment number. You can either mention 14 digit Aadhaar number or 28 digit Aadhaar enrolment number, if you do not have Aadhaar number. To enter your 28 digit enrolment id, first write the 14 digit enrolment id and then you also need to write the date. For instance if Aadhaar enrolment id is 1234/10480/02615 and Date is 06/05/2013 17: 50:10 then you should quote following as Aadhaar enrolment id. I have income from salary more than Rs 50 lakhs.Which form I need to file?.Also is there any requirement to disclose detail of assets held by the taxpayer in the ITR? In case of income from salary more than Rs 50 lakhs,ITR 2 will be applicable.ITR 1 is applicable only if income is less than Rs 50 lakhs. Yes there is a requirement to disclose the detail of assets held by the taxpayer in the ITR if the income of the taxpayer is more than Rs 50 lakhs. All the assets held by the taxpayer and corresponding liabilities is required to be disclosed in Schedule AL of the ITR form. Who can file the return in paper form (offline)? Individual who are of the age 80 years or more at any time during the financial year? There are various deductions that are not reflected in the Form 16 issued by the employer. Can I claim them in my return? Yes. Various deductions under Sec 80 such as ELSS,PPF,Life and health insurance,NSC,Children tuition fees,5 year fixed deposit, donation for charity, repayment of home loan can be claimed in ITR even if not mentioned in Form 16.You can also claim HRA (if you are paying the rent and it is a part of your salary structure) in ITR.It may happen that you miss to give the proof of rent receipts to your employer and so he did not give you the tax exemption for HRA in Form 16.But don’t worry , you can claim them in your ITR.